Door contacts, PIRs, Request-to-Exit pushbuttons, etc. 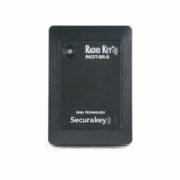 The (LF) RKDT-SR readers can be used where either HID® or Secura Key proximity cards are used. The RKDT-SR works with Secura Key 26-bit or 32-bit cards, or with HID Proximity cards with pass-through, non-proprietary formats. NOVA.16 accepts bit formats with 16 ID bits. The readers are available in both Mullion-mount and Switchplate configurations. The (HF) ET8-SR readers add Smart Card technology to the SK-NET system. The ET8-SR readers work with Secura Key e*Tag 13.56 MHz contactless smart cards and keytags, encoded with 26-bit or Secura Key 32-bit formatted access control data. They are also available in Mullion-mount or Decora® Wallswitch configurations. Secura Key also offers a Wiegand interface adaptor, SK-WIO-1, which is also designed for use with the NOVA.16 control panel, allowing non-Secura Key reader types, biometric readers, keypads, long range readers and other Wiegand Output devices to be connected to the NOVA.16 peripheral bus, functioning just like one of the Smart Readers. 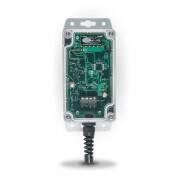 The SK-WIO-1 has latch and aux relays and two inputs for functions such as Door Monitor or REX buttons. Secura Key has recently added a wireless (HF) Smart Reader to it’s line of Smart Readers. The (HF) ET-SR-R-S is designed to work with the NOVA.16, SK-HUB and SK-NET. Using a proprietary wireless protocol, the wireless readers can be used independently or combined with other Smart readers to create a hybrid system.